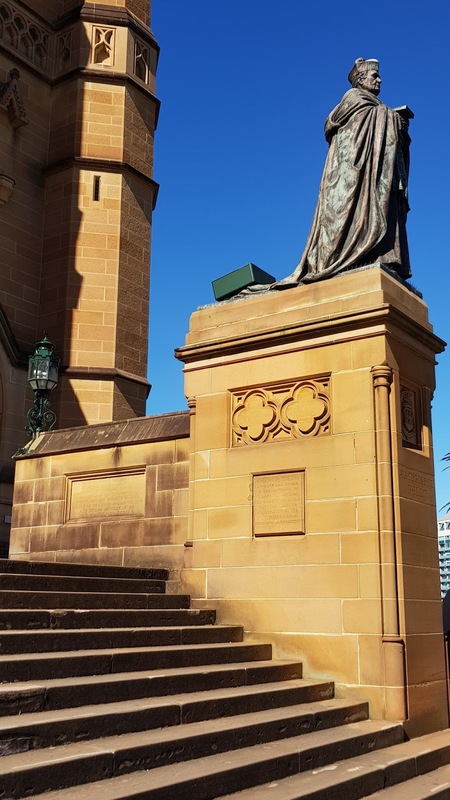 This bronze statue of Archbishop Michael Kelly stands beside the stairs leading up to the Cathedral Square entrance of St Mary's Cathedral. It was created by Bertram Mackennal and erected in 1933 to commemorate the 80th birthday of the fourth Roman Catholic Archbishop of Sydney, the completion of the Cathedral and the celebration of the 29th International Eucharistic Conference. It accompanies the statue of Cardinal Patrick Moran. Beautiful statue! with perfect blue sky at the background..
A great spot for it. And you've picked the right day to photograph it. Archbishop Kelly looks like a serious fellow. Bertram Mackennal became rightfully famous. You found some great light for this! Nice composition.